Arujyansu is a very popular hair dresser, located in Japan. They also do extensions and are therefore really popular with gyarus. It's actually pretty easy to book an appointment even if you don't know any Japanese at all. 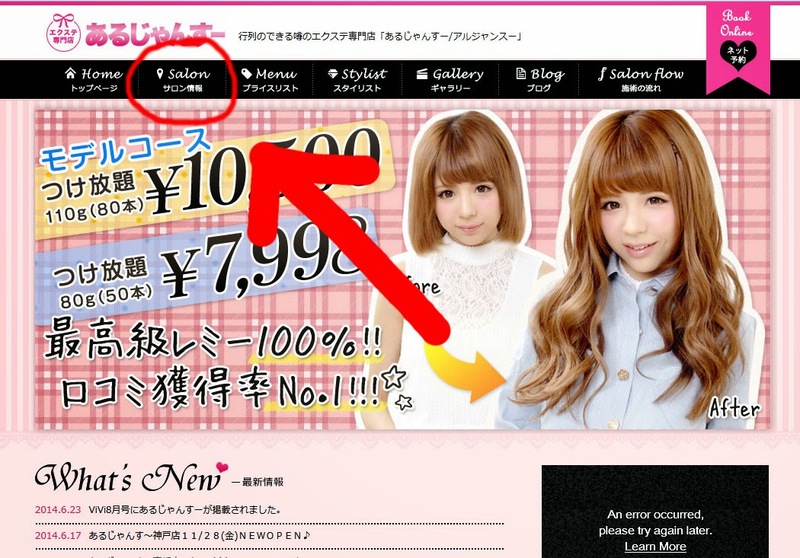 Then click on the menu point "Salon"
Now all salons in Japan are listed. If you are in Tokyo I recommend the Shibuya salon. All the others are not in Tokyo. See the locations above for each studio. 1) See my translation next to the Kanji. 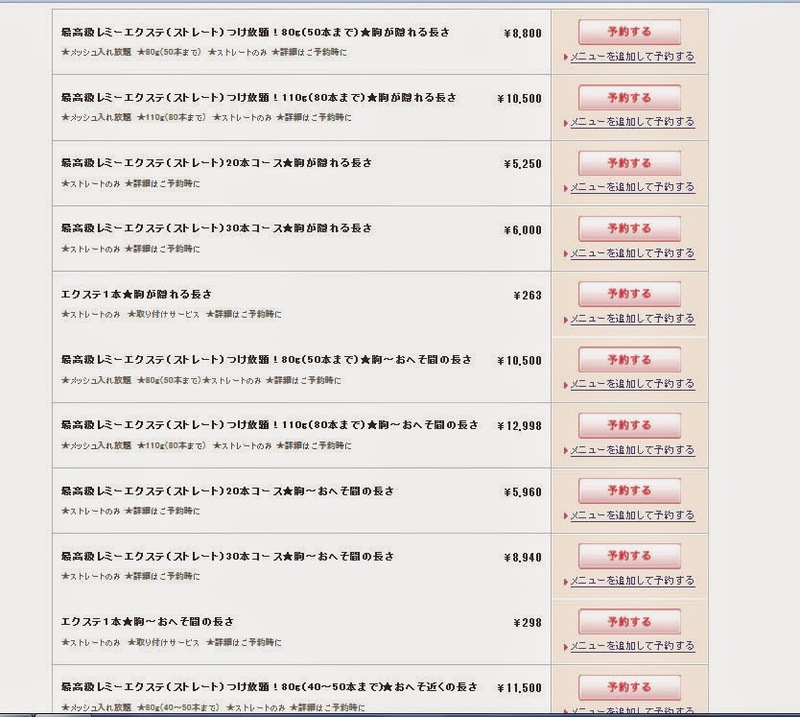 2) Or hover your mouse over the Kanji and you can see at the bottom of your page (I use firefox) where the store is located. This is the shibuya page. 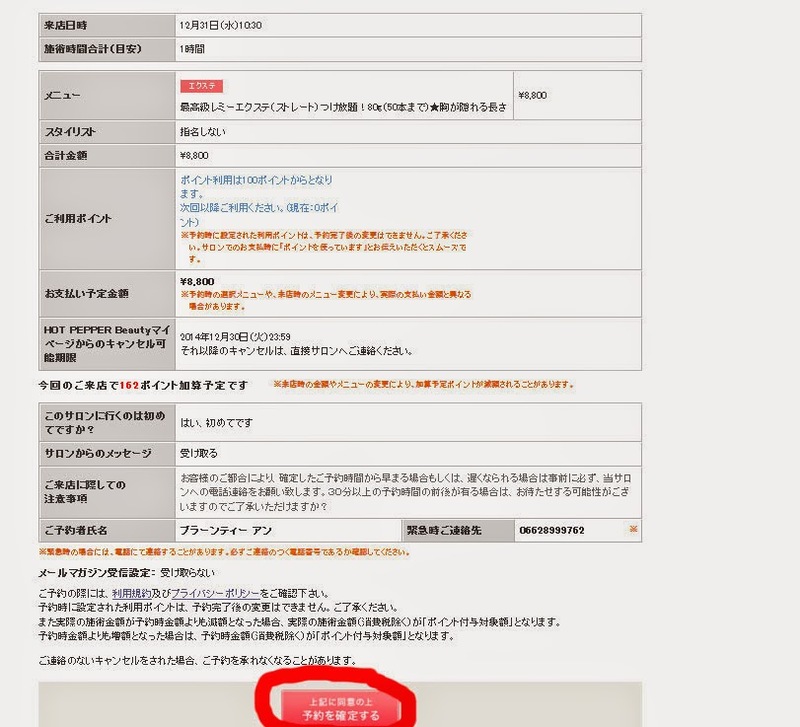 Click on the highlighted button. 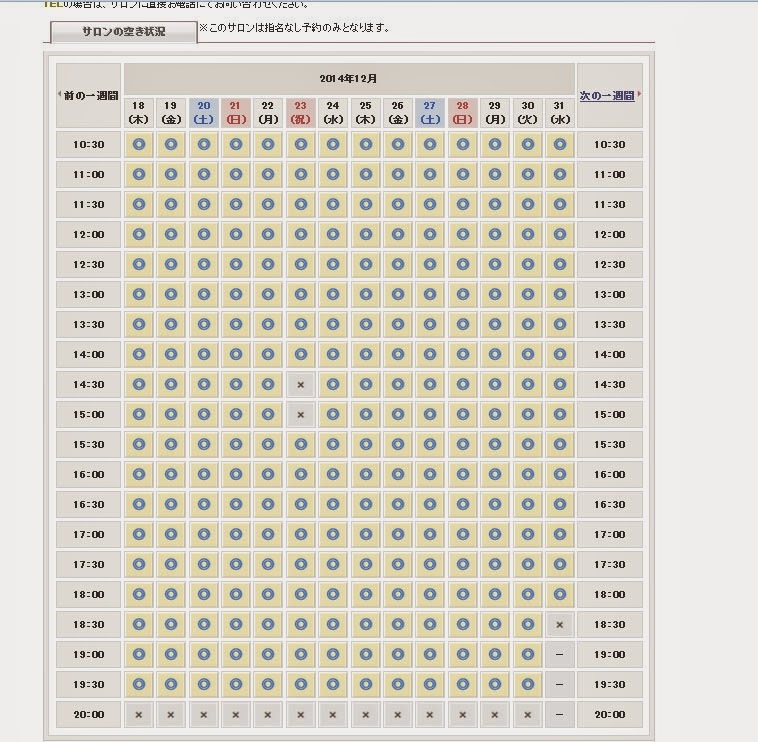 It will take you directly to the reservation page. This looks a bit intimidating, but fear not. You can either use google translate (which is a bit hilarious) or, if you don't know yet what you want, you can first go to their Hair-menu card and then choose. 2) How many gram of hair you want. It comes in 110g, 80g, 30g, 20g, and single. Once you have decided click on the pink button on the right hand side. Now is the time to choose a date and time for your appointment. The circle indicates that this time and date is still available. If there is an X then this time and date is already booked. If you want to book further ahead, press the top right button and it will deliver the next time and dates. Now, choose and click a circle. 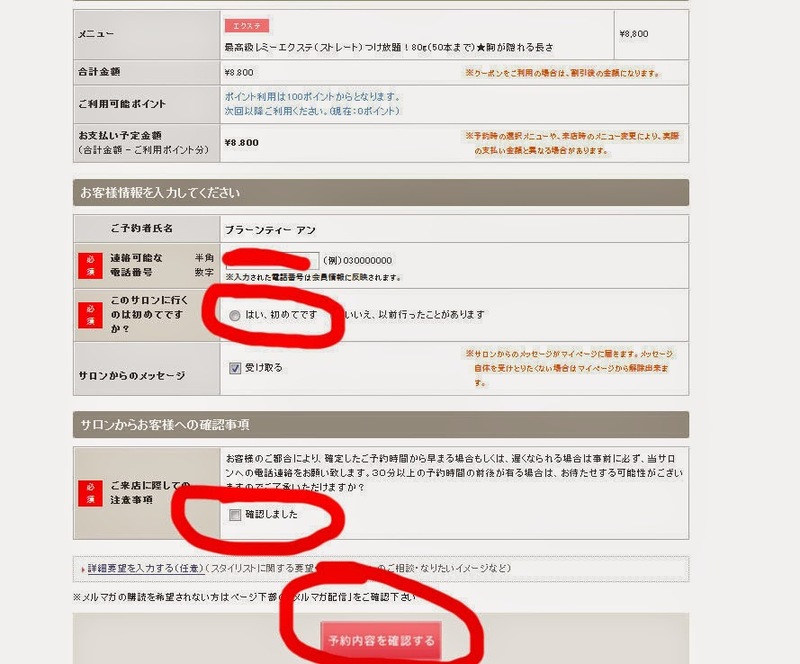 This will take you straight to the registration form (And when the registration is complete, it will take you back again). 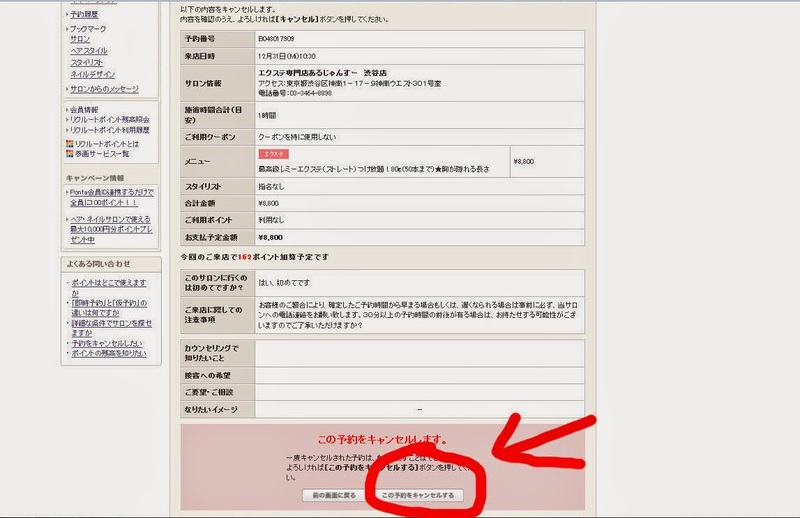 Click the highlighted pink button for new registration. Type in your email address where I wrote "example". It should be a full email address like "example@gmail.com"
Then click the pink button underneath. 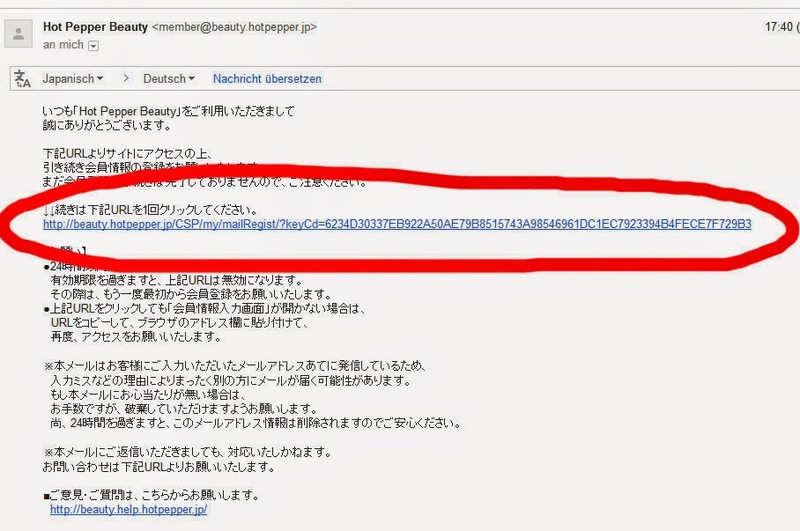 You should now get an Email from Hot Pepper Beauty to your address. If you got it in your mail, click this link to continue. It will open in a new window and you can actually already close the other one. This link will take you directly to another registration form. 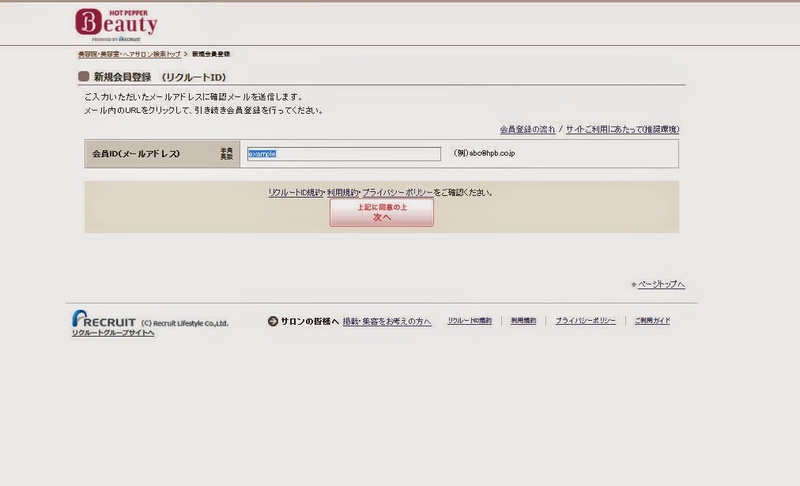 You will need either a keyboard which can write Katakana or you can search for a katakana converter on google, because you need to type in your Name and Surname both times in Katakana. The program will not take Roman alphabet. 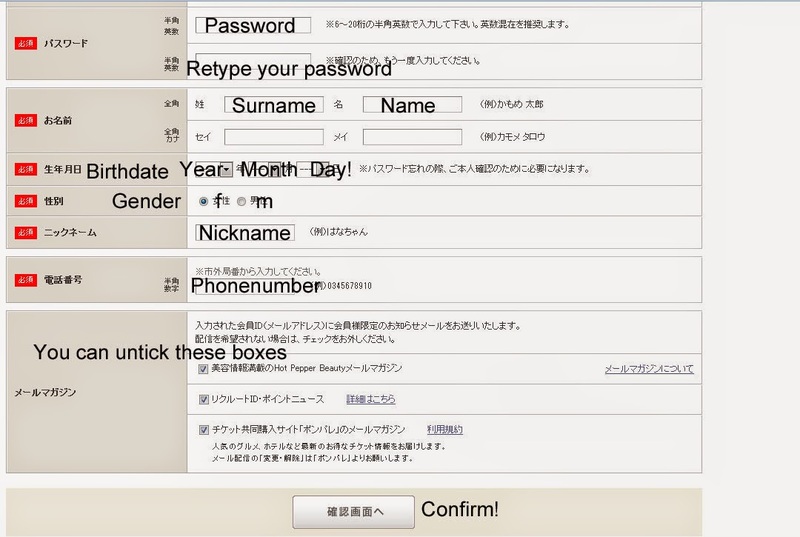 In the first box, type in your password. Then retype it in the second box. In the next four boxes, your type in your surname and then your name in katakana and then repeat underneath. There is a drop down menu for your birth date. Choose your gender and then choose a nickname. This can be any name and it can be in the roman alphabet. You can untick the next boxes or leave it. And then click the bottom button and confirm the data. This should pop up now. If this doesn't show, then you did something wrong and try it again. 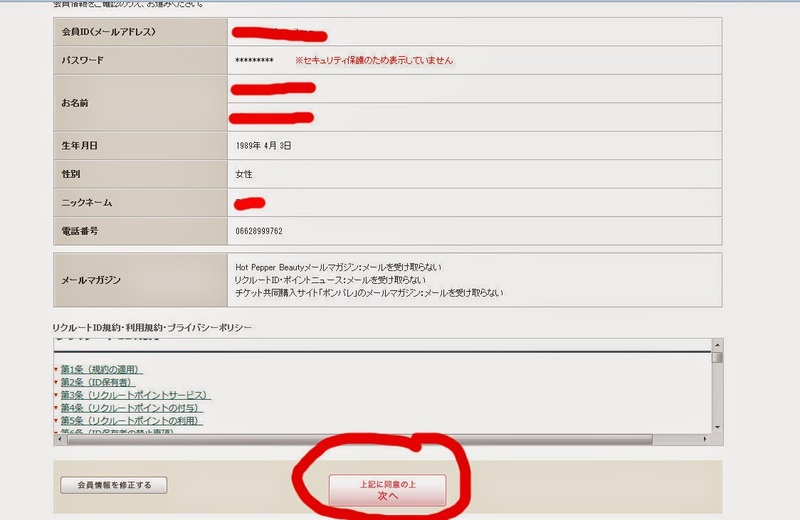 In the first box will be your telephone number, if there is not, type it in again. The second box asks if this is your first time, click on what I highlighted red. If you already went there before, then click the other one I didn't highlight. 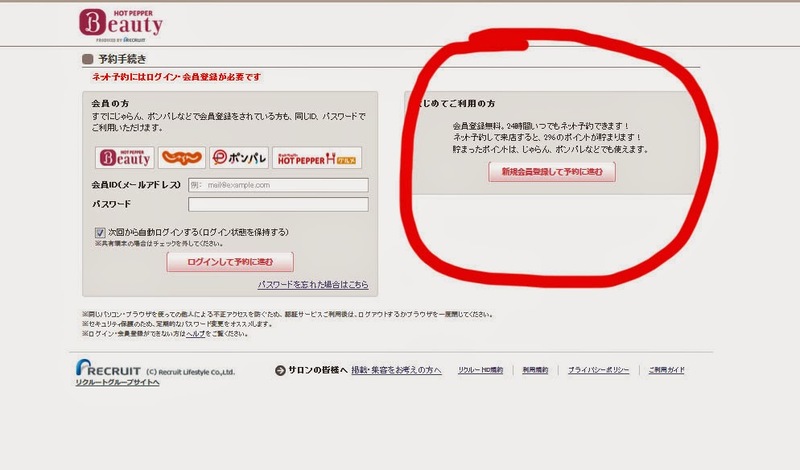 It's also important that you click the third box, without it, you can not continue. Here you can check again the time and date you booked and what menu you chose. (nearly done now :) ) then press the pink button. 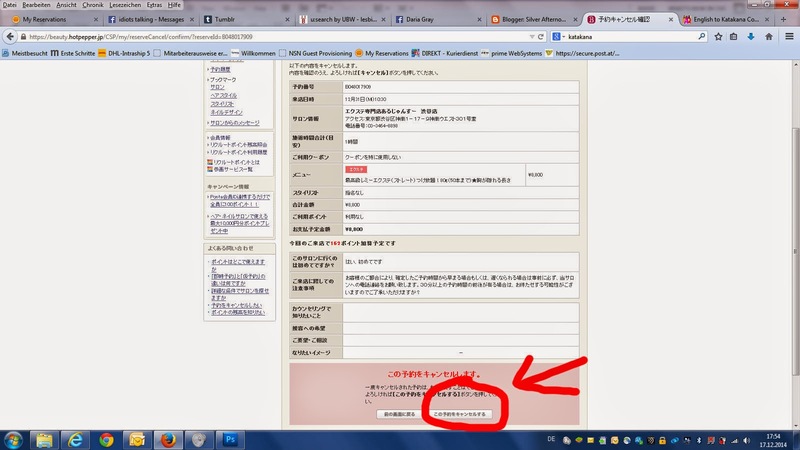 If this page shows up, you are done with the registration and you have successfully booked your appointment! Rejoice! You go directly to the homepage of Hot Pepper Beauty. There are links on the top right hand side and you click on "My page" which I highlighted in red for you. This will bring you to the site I screenshoted. Now click on the button I again highlighted. This means, that you want to cancel the appointment. 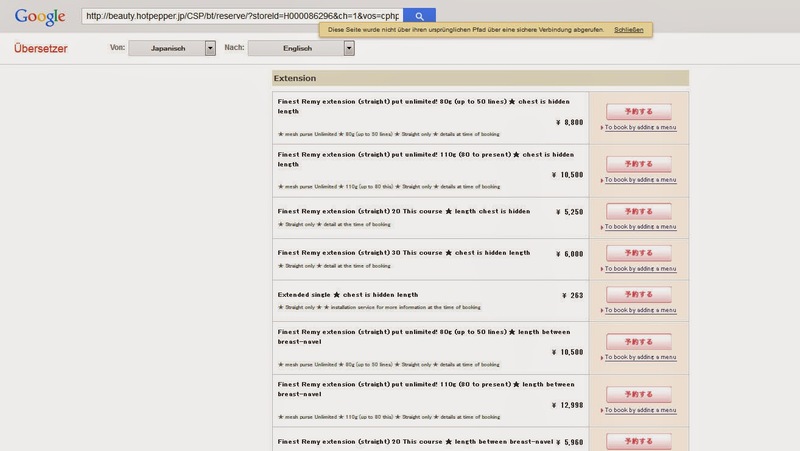 They show you the data again and you click on the right bottom, not the left. You have now successfully cancelled your appointment! 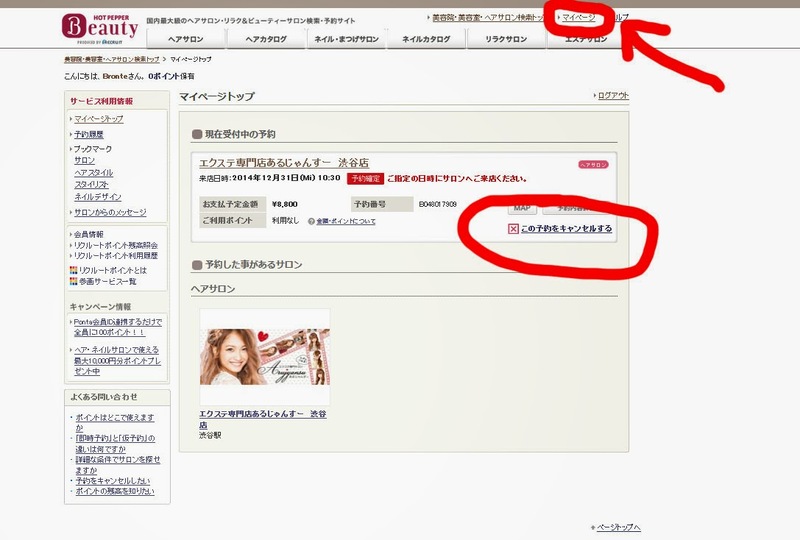 If there are any questions left, just click the pink button.. 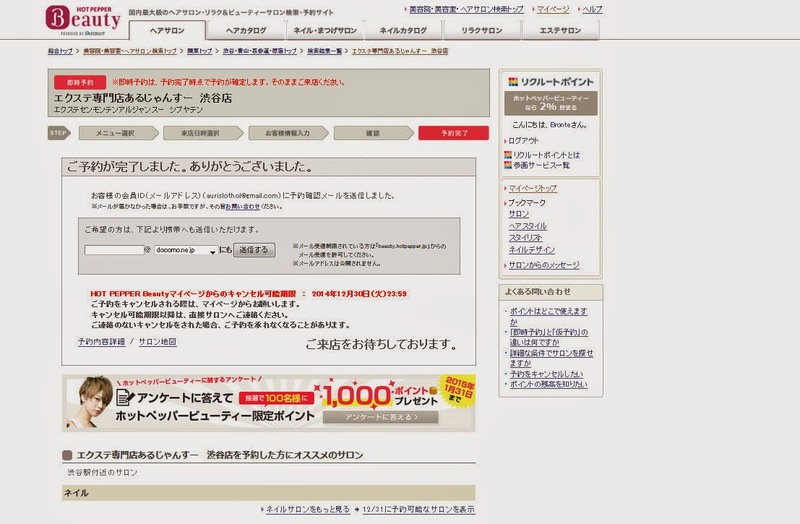 I know, somewhere in between you will be redirected to another site, so don't worry if it takes a bit longer and there is only some kanji on the screen. Enjoy your stay at Arujyansu.